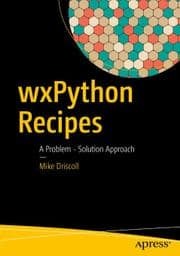 The subtitle for this article could easily be “How To Create PDFs with Python”, but WordPress doesn’t support that. 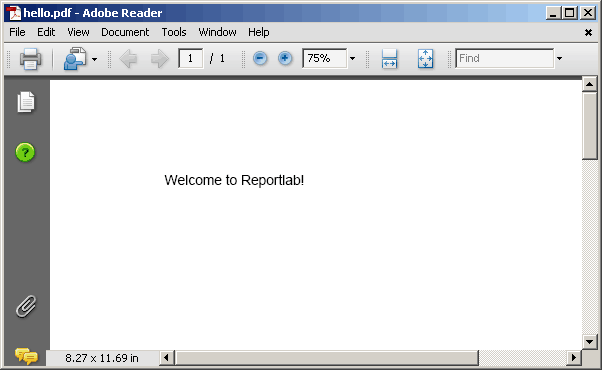 Anyway, the premier PDF library in Python is Reportlab. It is not distributed with that standard library, so you’ll need to download it if you want to run the examples in this tutorial. There will also be at least one example of how to put an image into a PDF, which means you’ll also need the Python Imaging Library (PIL). 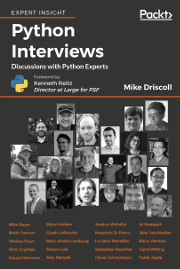 As I understand it, Reportlab is partially compatible with Python 2.x, IronPython and Jython. 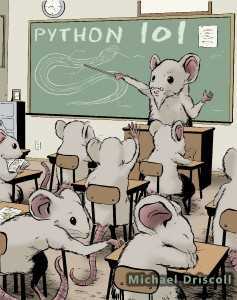 They are currently working on a port for Python 3.x (or will be soon). 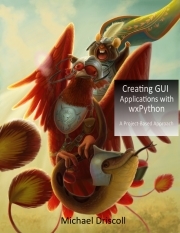 Reportlab supports most of the normal Python installation methods. For the old Reportlab 2.x versions you have the option of downloading the source and running “python setup.py install” or running a binary installer (on Windows). Note that Reportlab 3.x only supports Python 2.7 and Python 3.3+. If you are on an older version of Python 2, then you have to use Reportlab 2.x. Reportlab has decent documentation. What I mean by that is that the documentation gives you just enough to get started, but when you find something slightly complex to do, you get to figure it out on your own. Just recently, they added a Code Snippets section to their website that will hopefully become a recipe book of cool tips and tricks and also help ameliorate this issue. But enough about that. Let’s see how to actually create something! The first thing to notice about this code is that if we want to save the PDF, we need to supply a file name to the Canvas object. This can be an absolute path or a relative path. 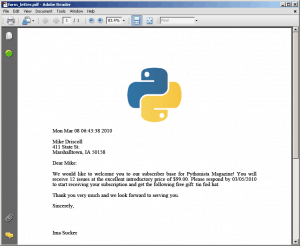 In this example, it should create the PDF in the same location that you run the script from. The next piece of the puzzle is the drawString method. This will draw text wherever you tell it to. When using the canvas object, it starts at the bottom left of the page, so for this example, we told it to draw the string 100 points from the left margin and 750 points from the bottom of the page (1 point = 1/72 inch). You can change this default in the Canvas constructor by passing a zero to the bottomup keyword argument. However, I’m not exactly sure what will happen if you do that as the Reportlab user guide isn’t clear on this topic. I think it will change the start point to the top left though. The final piece in the code above is to save your PDF. The above was pulled directly from the Reportlab User Guide, page 11. You can read about the other options in their guide if you want the full details. Now let’s do something a little more complicated and useful. In this example, we’ll create a partial printable form. As far as I can tell, Reportlab doesn’t support the fillable forms that were added to Adobe products a few years ago. Anyway, let’s take a look at some code! This is based on an actual receipt I created at work. The main difference between this one and the previous example is the canvas.line code. You can use it to draw lines on your documents by passing two X/Y pairs. I’ve used this functionality to create grids, although it’s pretty tedious. Other points of interest in this code include the setLineWidth(.3) command, which tells Reportlab how thick or thin the line should be; and the setFont(‘Helvetica’, 12) command, which allows us to specify a specific font and point size. Our next example will build on what we’ve learned so far, but also introduce us to the concept of “flowables”. freeGift = "tin foil hat"
Well, that’s a lot more code than our previous examples contained. We’ll need to look over it slowly to understand everything that’s going on. When you’re ready, just continue reading. From enums, we import “TA_JUSTIFY”, which allows our strings to have the justified format. There are a number of other constants we could import that would allow us to right or left justify our text and do other fun things. Next is the platypus (which stands for Page Layout and Typography Using Scripts) module. It contains lots of modules, but probably the most important of them are the flowables, such as Paragraph. A flowable typically has the following abilities: wrap, draw and sometimes split. 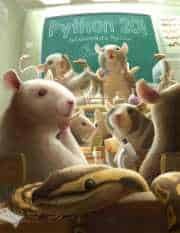 They are used to make writing paragraphs, tables and other constructs over multiple pages easier to do. The SimpleDocTemplate class allows us to set up margins, page size, filename and a bunch of other settings for our document all in one place. A Spacer is good for adding a line of blank space, like a paragraph break. 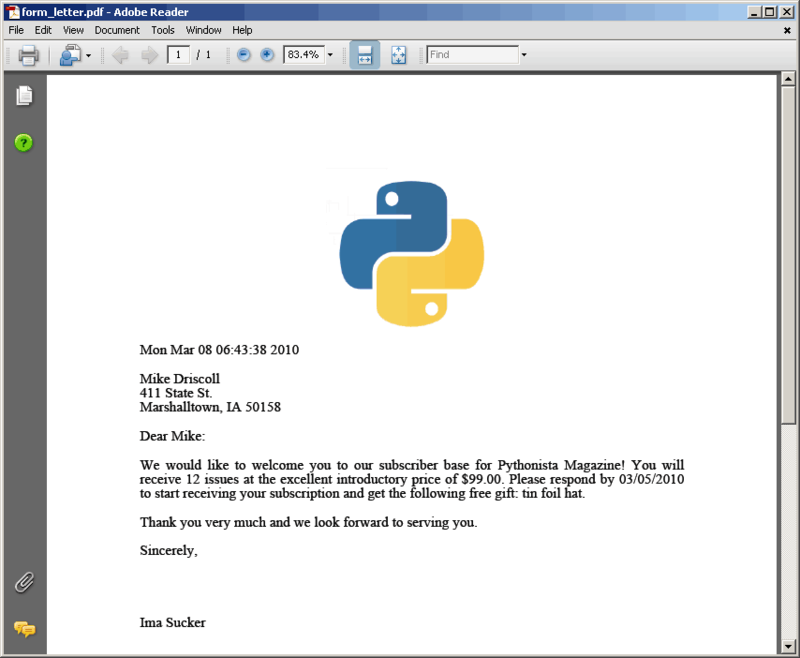 The Image class utilizes the Python Image Library to allow easy insertion and manipulation of images in your PDF. The getSampleStyleSheet gets a set of default styles that we can use in our PDF. ParagraphStyle is used to set our paragraph’s text alignment in this example, but it can do much more than that (see page 67 of the user guide). Finally, the inch is a unit of measurement to help in positioning items on your PDF. You can see this in action where we position the logo: Image(logo, 2*inch, 2*inch). This means that the logo will be two inches from the top and two inches from the left. For our first line of text, we use the Paragraph class. As you can see, the Paragraph class accepts some HTML-like tags. In this instance, we set the font’s point size to 12 and use the normal style (which is left aligned, among other things). The rest of the example is pretty much the same, just with Spacers thrown in here and there. At the end, we call doc.build to create the document. 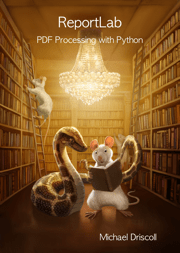 Now you know the basics for creating PDFs in Python using Reportlab. We didn’t even scratch the surface of what all you can do with Reportlab though. Some examples include tables, graphs, paginating, color overprinting, hyperlinks, graphics and much more. I highly recommend that you download the module along with its user guide and give it a try!